Neil Giacobbi, AT&amp;T public affairs director for New York State and Metro New York City, talks about the AT&amp;T Rochester Civic App Challenge as MAGIC Center Director Andrew Phelps, left, and RIT President Bill Destler listen. Jennifer Kotler has plans for a game to teach children about nutrition. Kotler, a fourth-year medical illustration major from Merrick, N.Y., is participating in the AT&T Rochester Civic App Challenge, a two-month virtual hackathon that wraps up in late April. 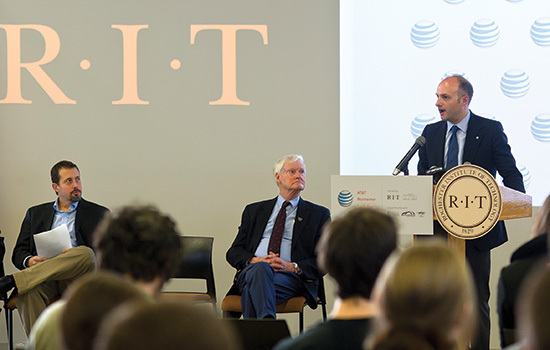 Technology giant AT&T, supported by RIT and assisted by Digital Rochester, High Tech Rochester and Hack Upstate, launched the challenge in which developers will leverage open data to build smartphone apps that serve community needs. Top winners will be announced in early May. “Civic hacking is really amazing because you create projects that can actually make a difference in people’s lives,” Kotler said. RIT’s MAGIC Center (Media, Arts, Games, Interaction and Creativity) is home base for the event. More than 100 people, from as far west as Buffalo and as far east as Oswego, participated in a 24-hour hackathon that launched the challenge. The challenge will award prizes in two categories: one for apps already under development and another for those created for this contest. First place comes with a $5,000 grand prize. Second-place winners will receive $2,000; third place $1,000 and honorable mentions $500 each. Submitted apps will be judged on potential impact on Greater Rochester, execution and creativity or novelty. The judges are local tech experts, community leaders and elected officials, including Assembly Majority Leader Joseph Morelle (D-Irondequoit) and State Sen. Patrick Gallivan (R-Henrietta). MAGIC Center Director Andrew Phelps said the challenge presents an exciting opportunity for students and faculty, as well as the greater community.